Egg. Banana. Tomato base. Beans. Sound familiar? If you’ve been keeping up with this blog it should. I mixed things up today with a heaping spoonful of peanut butter and an apple for an afternoon snack, but otherwise my office days are becoming deja vu in the food department. Don’t get me wrong: there ain’t nothing wrong with leftovers. Cold pasta was my breakfast of choice for years. It’s that I don’t have a choice with my budget restrictions. I can’t make a last minute decision to run out for lunch without suffering the consequences later. Food is perishable. If I don’t eat what I have and it goes bad, I don’t get my money back. It makes me wonder how many programs or workshops there are to help people using SNAP to map out their meals intelligently to maximize their dollars without sacrificing nutrition or sanity. Community-supported agriculture (CSA; sometimes known as community-shared agriculture) refers to a particular network or association of individuals who have pledged to support one or more local farms, with growers and consumers sharing the risks and benefits of food production. CSA members or subscribers pay at the onset of the growing season for a share of the anticipated harvest; once harvesting begins, they receive weekly shares of vegetables and fruit. This is what our weekly share looks like. This is yet another road-block I expected to hit during my #SNAPChallenge. 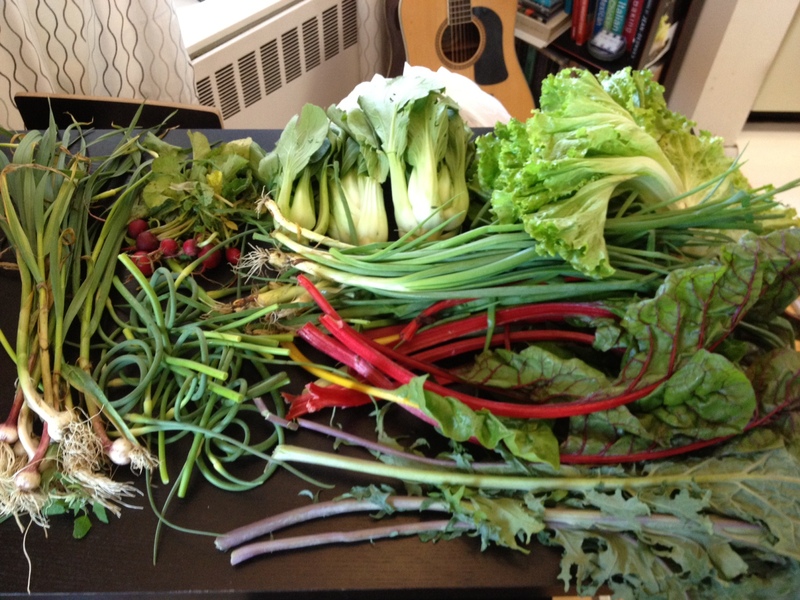 Since we had pre-paid for the CSA in April, the shares are ours every week whether we want them or not. In addition, there are CSA’s that work with SNAP participants so that they can participate in the program, so I decided to calculate my weekly cost and factor it into my SNAP budget. This means $7.95 gone to vegetables. Had I picked up my share earlier I may have gotten the allotted amount, which was much less than I anticipated, but I lucked out and got a larger share since I arrived 15 minutes before closing. 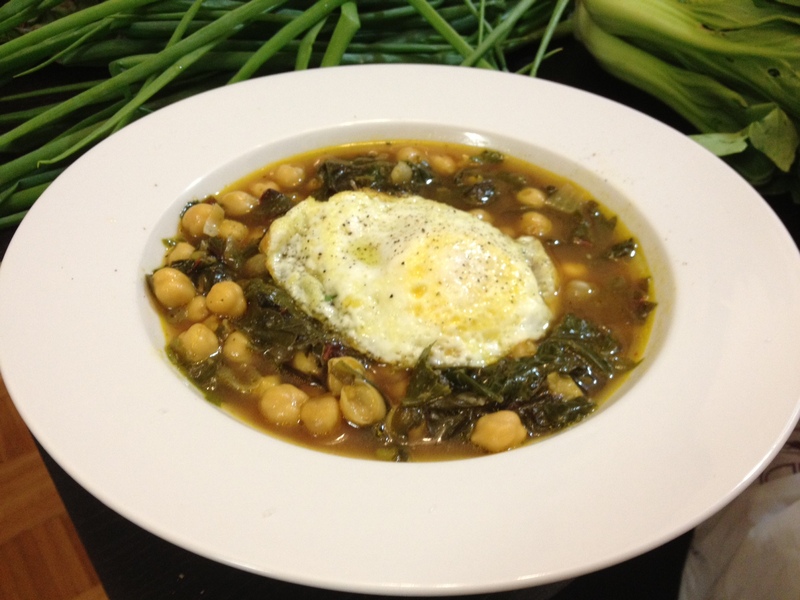 I used some kale, swiss chard, garlic scapes, and spring onion to make a chick pea soup. The chicken stock from earlier this week came in handy, as did the tomato sauce. I instinctively topped it off with a fried egg without thinking. I’m hoping I don’t regret that later in the week, as it was really just a frivolous thing to do, even though adding an egg to anything automatically makes it more awesome. I did the SNAP challenge two years ago and really increased my awareness of issues around poverty and hunger. I look at things much differently now.